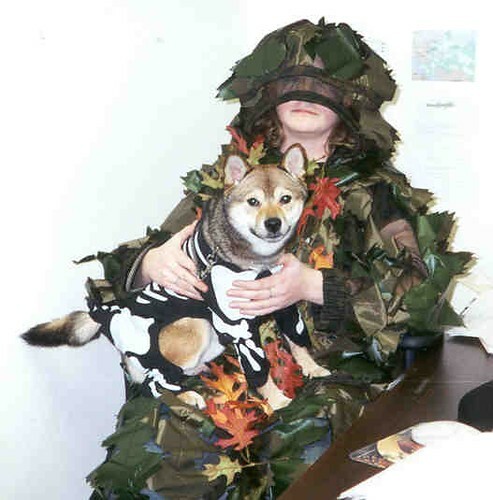 It’s not often you see a shiba in a skeleton costume and a human in a leaf costume! Yes true, this is very rare. Happy weekend. Id be afraid he would “lift his leg” on the “leaf”! Rare indeed and rare that the dog would allow this. My dog would have to be muzzled to put this costume on! The only thing that would be more rare would be if the boy had a dog costume on. LOL… I must admit I’ve never seen any breed of dog dressed as a skeleton before, though I have seen people dressed in camouflage before. Good photo. Everyone is invited to my blog to see my “rare” post. Hope to see you there. LOL! I love the leaf costume! I think if I ever tried to get my cat Theo into a costume, I’d be needing several stitches! About the caption you have there for your rare picture, I have to admit you have a point there. You’re right … that’s not something you see every day.